The Saskatchewan Aviation Museum and Learning Centre in Saskatoon has begun crowd funding through a GoFundMe page to raise money for the restoration of an aircraft of historic significance. The Cessna 180 CF-JDO aircraft was retrieved earlier this year after resting in Peter Pond Lake in Northern Saskatchewan for 60 years. Pilot Ray Gran and conservation officer Harold Thompson were on board the Saskatchewan Government Airways Cessna 180 aircraft when it went missing in 1959. Sixty years ago, the technology to find and raise the wreck either didn’t exist or was not available. However, about a year ago Gran’s daughter Linda Kapusta and her husband Don organized a search using modern sonar equipment. The aircraft, which was lying on the bottom of the lake, quickly appeared on the screen. 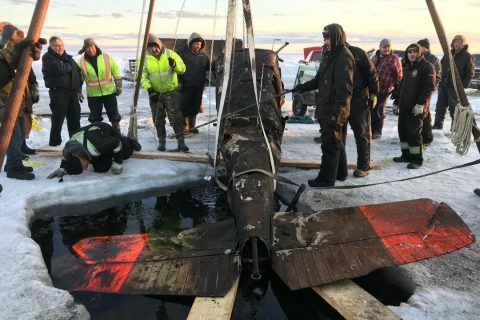 Don Kapusta and his crew from Ontario, as well as Dorrin Wallace, Saskatchewan Aviation Museum president, bush pilot and businessman planned and led the recovery procedure. The badly- damaged wreck was raised and trucked to the museum building at Hangar 5 at the Saskatoon airport. At the request of the northern community the aircraft will remain in the museum hangar on display for the next year, after which restoration will begin. To donate to the museum’s goal of $150,000, visit gofundme.com/help-bring-our-mystery-airplane-home. Donation receipts will be provided upon an email request to the Saskatchewan Aviation Museum Learning Centre, office@saskaviation.ca.